Diabetes mellitus (DM) is an increasingly common medical condition affecting approximately 8% of the population of the United States. Of these 25 million people, it is estimated that nearly 7 million are unaware that they have the disease until faced with associated complications. [1, 2] The prevalence of DM is even greater in hospitalized patients. The American Diabetes Association conservatively estimates that 12-25% of hospitalized adult patients have diabetes mellitus (DM). With the increasing prevalence of diabetic patients undergoing surgery, and the increased risk of complications associated with diabetes mellitus, appropriate perioperative assessment and management are imperative. Infections account for 66% of postoperative complications and nearly one quarter of perioperative deaths in patients with DM. Data suggest impaired leukocyte function, including altered chemotaxis and phagocytic activity. Tight control of serum glucose is important to minimize infection. In 2001 Van den Berghe and colleagues demonstrated a significant mortality benefit with using continuous insulin infusions to maintain glycemic control at 80-110 mg/dL. Other studies showed similar results. [15, 16] The attempts to recreate these data have generated conflicting data, as well as questions including to what degree glycemic control can be safely maintained and whether the needed resources are justifiable. The benefits of tighter glycemic control have been well documented in many patient populations; however, the optimal range for glucose has yet to be well defined. Studies have also identified the potential cost of tight glycemic control because of the increased incidence of severe hypoglycemia. Balancing the risks of hypoglycemia against the known benefits in morbidity and mortality is the goal, and, although intensive glycemic control continues to be standard of care, current consensus guidelines recommend less stringent glycemic goals, typically between 80-150 mg/dL. The ultimate goal in the management of diabetic patients is to achieve outcomes equivalent to those in patients without DM. A meta-analysis of 15 studies reported that hyperglycemia increased both in-hospital mortality and incidence of heart failure in patients admitted for acute myocardial infarction, independent of a previous diagnosis of DM, demonstrating that the presence of DM is not as important as the control of blood glucose concentrations. Comprehensive preoperative assessment and intensive intraoperative and postoperative management by a multidisciplinary team are recommended. A strong grasp of glucose insulin complexities and the effects of anesthesia and surgery are essential to optimizing outcomes. For more information, see Diabetes Mellitus, Type 1. For more information, see Diabetes Mellitus, Type 2. For excellent patient education resources, visit eMedicineHealth's Diabetes Center. In addition, see eMedicineHealth's patient education articles Diabetes, Peripheral Vascular Disease, and Hypoglycemia (Low Blood Sugar). Glucose metabolism is largely a function of the liver, the pancreas, and, to a lesser degree, peripheral tissues. The liver plays a variety of roles in glucose regulation: it extracts glucose and stores it in the form of glycogen and performs gluconeogenesis as well as glycogenolysis. The pancreas secretes counter-regulatory hormones: insulin from islet beta cells, which lowers blood glucose concentrations, and glucagon from islet alpha cells, which raises blood glucose concentrations. Additional contributors to glucose metabolism include the catabolic hormones: epinephrine, glucocorticoids, and growth hormone, all of which raise blood glucose concentrations. Peripheral tissues participate in glucose metabolism by extracting glucose for energy needs, thus lowering blood glucose levels. Appropriate glucose regulation preserves the availability of glucose to these tissues. For example, in the fasting state, insulin secretion decreases and catabolic hormone levels rise. In the case of absolute insulin deficiency (type 1 diabetes mellitus), unopposed catabolic action leads to hyperglycemia and, eventually, diabetic ketoacidosis. Type 2 diabetes mellitus is characterized by a peripheral resistance to insulin, and, in general, patients are less susceptible to developing ketoacidosis. The foundation of the preoperative assessment is a comprehensive history and physical examination. Because estimates suggest that one quarter of diabetic patients are unaware of their disease, it may be prudent to screen all patients undergoing intermediate or major surgery by checking glycosylated hemoglobin (HbA1c or A1C). In patients with known DM, the standard preoperative documentation should be expanded to include the following details of current diabetes management: duration of treatment, specific medication regimen, and issues with insulin resistance or hypersensitivity. If available, this information will be detailed in the patient's diabetes journal. The history should assess for symptoms of cardiac, retinal, renal, neurologic, and peripheral vascular disease. Because the mortality rate from heart disease is 2-4 times greater in diabetic patients than nondiabetic individuals, a comprehensive cardiac history should be completed for patients undergoing intermediate or major noncardiac surgery. In patients undergoing major vascular surgery, this should include either noninvasive myocardial function studies (dobutamine stress echocardiography) or coronary artery angiography. The physical examination includes assessment for orthostatic hypotension, a potential sign of autonomic neuropathy. A funduscopic examination may provide insight into the patient's risk of developing postoperative blindness, especially following prolonged spinal surgery in the prone position and cardiac surgery requiring cardiopulmonary bypass. Type 1 DM is associated with a "stiff joint" syndrome, which poses a significant risk during airway management at the time of general anesthesia. The temporomandibular, atlantooccipital, and other cervical spine joints may be affected. These patients also tend to have short stature and waxy skin, related to chronic hyperglycemia and nonenzymatic glycosylation of collagen and its deposition in joints. 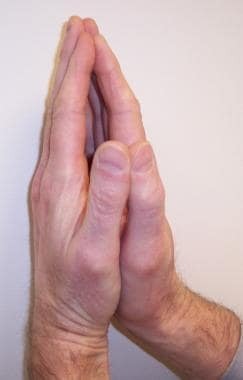 An inability to approximate the palmar surfaces of the phalangeal joints while pressing the hands together—a positive "prayer sign" (see the image below)—represents cervical spine immobility and the potential for a difficult endotracheal intubation. A positive "prayer sign" can be elicited on examination with the patient unable to approximate the palmar surfaces of the phalangeal joints while pressing their hands together; this represents cervical spine immobility and the potential for a difficult endotracheal intubation. Further airway evaluation should include assessment of thyroid gland size, as patients with type 1 DM have a 15% association of other autoimmune diseases, such as Hashimoto thyroiditis and Graves disease. Finally, the degree of preoperative neurologic dysfunction is important to document, especially before the administration of regional anesthesia or peripheral nerve blocks, to assess the degree of subsequent nerve injury. Given that patients with DM are treated with a variety of regimens and are scheduled for surgery at varying times of the day, there is no established consensus for optimal perioperative management. [3, 5, 6, 19, 20] However, using general management principles to minimize the likelihood of hypoglycemia and to limit the incidence of excessive hyperglycemia should guide decision making. Patients should communicate specifics of their surgical procedure to their endocrinologist or internist and, in conjunction with their anesthesiologist, be advised on modifications to their current regimen. In general, on the day of surgery, patients on oral regimens should be advised to discontinue these medications. Secretagogues (eg, sulfonylureas, meglitinides) have the potential to cause hypoglycemia. In addition, sulfonylureas may interfere with ischemic myocardial preconditioning and may theoretically increase the risk of perioperative myocardial ischemia and infarction. Patients taking metformin should be advised to discontinue this drug preoperatively because of the risk of developing lactic acidosis. For these patients, short-acting insulin may be administered subcutaneously on a sliding scale or as a continuous infusion, to maintain optimal glucose control, depending on the type and duration of surgery. Patients who are insulin dependent are typically advised to reduce their bedtime dose of insulin the night before surgery to prevent hypoglycemia while nil per os (NPO). Maintenance insulin may be continued, based on the history of glucose concentrations and the discretion of the advising clinician. Patients may be advised to consult with their anesthesiologist and diabetes-managing practitioner for individualized recommendations regarding their diabetes plan. Additionally, patients should be monitored preoperatively to assess for hyperglycemia and hypoglycemia. Surgery induces a considerable stress response mediated by the neuroendocrine system through the release of catecholamines, glucagon, and cortisol. The principal mechanism lies with the elevation of sympathetic tone, with a subsequent release of cortisol and catecholamines during surgery. This compensatory mechanism is impaired in diabetic patients through a relative insulin deficiency (type 2) or an absolute insulin deficiency (type 1), necessitating supplemental insulin in the perioperative period. Thus, patients with type 1 DM usually require intravenous insulin therapy, depending on the nature of surgery, and are more predisposed to end-organ complications than patients with type 2 DM. Patients with type 2 DM need to have their oral hypoglycemic drugs discontinued preoperatively, with intravenous insulin administered if dictated by the extent of the procedure. Even nondiabetic patients, because of the considerable stress response, may become hyperglycemic perioperatively. Multiple randomized controlled studies have shown that controlling serum glucose levels in all patients, not merely those with DM, impacts the outcome of surgical patients who are critically ill. This effect does not appear to be related to the dose of insulin but rather to the absolute level of serum glucose achieved. Anesthetic agents can affect glucose metabolism through the modulation of sympathetic tone; in vitro data suggest that inhalational agents suppress insulin secretion. The resulting relative insulin deficiency often leads to glucose dysregulation and hyperglycemia. This deficiency is compounded in diabetic patients, particularly those with insulin resistance, raising the risk of ketoacidosis. The use of regional anesthesia or peripheral nerve blocks may mitigate these concerns, but no data suggest that these forms of anesthesia improve postoperative survival in patients with DM. The goals for glycemic control are tailored to each patient based on a number of factors, such as the nature of the surgery, severity of the underlying illness, modality used to achieve glycemic control, patient age, and sensitivity to insulin. Numerous clinical trials have involved various patient populations and examined the implications of perioperative hyperglycemia. Based on data derived from these studies, the American Diabetes Association made recommendations for managing blood glucose levels in hospitalized patients with DM (see Table 1). ‡American Heart Association/American Stroke Association. An elevated HbA1c immediately before surgery may provide insight to a patient’s risk for postoperative diabetic-related complications. Before elective surgery, an HbA1c value of less than 6% would be ideal. It is unknown whether tighter glycemic control may further reduce complications; however, tighter control comes at the cost of an increased risk of hypoglycemia. Less intensive glycemic control may be indicated in patients with severe or frequent episodes of hypoglycemia. Special populations of diabetic patients, such as pregnant women and the elderly, may require additional considerations. In addition, a plan for hypoglycemia should be delineated for individual patients. For more information, see Hyperosmolar Hyperglycemic State. Because of the numerous potential perioperative complications in diabetic patients, close monitoring is imperative to maintain glycemic control, while minimizing hypoglycemia. After assessment, patients who were taking oral agents before surgery may be able to restart their previous regimen postoperatively. However, the appropriateness of oral agents needs to be reassessed because of potential complications (see Table 2). Intravenous insulin is the most flexible and readily titratable agent, making it an ideal modality for perioperative use. The length of surgery, the type of surgery, and the degree of glycemic dysregulation dictate the amount of supplemental insulin. For patients with type 1 DM, it is recommended to schedule elective surgeries as the first case of the day to minimally disrupt their DM regimen. Depending on the length and extent of surgery, patients may be advised to administer one half of their daily dose of long-acting insulin and to arrive at the preoperative admitting area early enough to have their serum glucose monitored and to determine whether they need intravenous dextrose until the time of surgery. Establish separate intravenous access for a "piggyback" infusion of regular insulin (100 U per 100 mL 0.9% saline). The infusion rate can be determined by using the following formula: insulin (U/hr) = serum glucose (mg/dL)/150. Intra-arterial catheter placement is recommended to facilitate checking blood glucose concentrations every 1-2 hours intraoperatively and postoperatively. A second intravenous catheter may be used for intravascular volume replacement with a normal saline solution. An example of such a system is the Glucommander. Initial parameters and baseline glucose value are entered. The program then recommends an insulin infusion rate and intervals to check subsequent glucose levels; this process may be repeated indefinitely. The amount of insulin recommended is based on a simple equation: insulin per hour = multiplier x (blood glucose – 60). Blood glucose concentrations are monitored as frequently as every 20 minutes up to a maximum interval specified in the initial orders. Typically, the monitoring interval is every hour, lengthening when glucose values stabilize in the target range and shortening if blood glucose values are changing rapidly. The Glucommander has been successfully implemented in critically ill, as well as noncritically ill, patient populations. Ongoing studies are assessing the utility of the Glucommander (see Clinical Trials and Guidelines). Postoperatively, diabetic patients present unique challenges. Initiation of nutrition is often delayed and frequently interrupted for diagnostic studies or procedures. To reduce the likelihood of adverse effects, the regimen selected should accommodate ongoing changes and reflect the patient's current clinical status. These include nutritional feeding (continuous vs intermittent), severity of illness, and corticosteroid and catecholamine use. Table 3 summarizes the numerous complications of DM and the methods to minimize perioperative morbidity and mortality. Perioperative beta-blocker therapy should be considered for all diabetic patients undergoing intermediate or major risk noncardiac surgery as a means to decrease the incidence of postoperative myocardial ischemia and infarction. It is prudent to also assess all patients for orthostatic hypotension. This is easily diagnosed by performing a "tilt test" in the operating room, with patients receiving appropriate intravascular volume resuscitation before initiating any form of regional or general anesthesia. Patients suspected of gastroparesis should receive a prokinetic drug before the administration of general anesthesia to decrease the incidence of gastric acid aspiration. Aseptic technique is particularly critical for patients with DM to decrease the incidence of postoperative infection. In addition, temperature control is also essential, as hypothermia can lead to peripheral insulin resistance, hyperglycemia, deceased wound healing, and infection. Hypothermia has been associated with an increase in wound infection following colon resection, craniotomy for cerebral aneurysm clipping, and open heart surgery with cardiopulmonary bypass. Intraoperative management of intravascular volume may require the use of a central venous pressure catheter, a pulmonary artery catheter, or transesophageal echocardiography (TEE) to optimally guide therapy and to prevent end-organ hypoperfusion. Arterial blood gas (ABG) analysis should include assessment of blood glucose levels, in addition to sodium, potassium, and pH. Patients with type 1 DM are predisposed to developing ketoacidosis during periods of major stress; therefore, they should be monitored by arterial blood gas analysis during and after major surgery. American Diabetes Association. All about diabetes. Available at http://www.diabetes.org/about-diabetes.jsp. Accessed: February 26, 2013. Capes SE, Hunt D, Malmberg K, Gerstein HC. Stress hyperglycaemia and increased risk of death after myocardial infarction in patients with and without diabetes: a systematic overview. Lancet. 2000 Mar 4. 355(9206):773-8. [Medline]. Hall GM, Page SR. Diabetes and surgery. Page SR, Hall GM, eds. Emergency and Hospital Management. London, UK: BMJ Publishing; 1999. Hirsch IB, McGill JB, Cryer PE, White PF. Perioperative management of surgical patients with diabetes mellitus. Anesthesiology. 1991 Feb. 74(2):346-59. [Medline]. Alberti KG, Thomas DJ. The management of diabetes during surgery. Br J Anaesth. 1979 Jul. 51(7):693-710. [Medline]. Gavin LA. Perioperative management of the diabetic patient. Endocrinol Metab Clin North Am. 1992 Jun. 21(2):457-75. [Medline]. Hollenberg M, Mangano DT, Browner WS, et al. Predictors of postoperative myocardial ischemia in patients undergoing noncardiac surgery.The Study of Perioperative Ischemia Research Group. JAMA. 1992 Jul 8. 268(2):205-9. [Medline]. Risum O, Abdelnoor M, Svennevig JL, et al. Diabetes mellitus and morbidity and mortality risks after coronary artery bypass surgery. Scand J Thorac Cardiovasc Surg. 1996. 30(2):71-5. [Medline]. Rodriguez BL, Lau N, Burchfiel CM, et al. Glucose intolerance and 23-year risk of coronary heart disease and total mortality: the Honolulu Heart Program. Diabetes Care. 1999 Aug. 22(8):1262-5. [Medline]. [Full Text]. Van den Berghe G, Wilmer A, Hermans G, et al. Intensive insulin therapy in the medical ICU. N Engl J Med. 2006 Feb 2. 354(5):449-61. [Medline]. [Full Text]. Lazar HL, Chipkin SR, Fitzgerald CA, et al. Tight glycemic control in diabetic coronary artery bypass graft patients improves perioperative outcomes and decreases recurrent ischemic events. Circulation. 2004 Mar 30. 109(12):1497-502. [Medline]. [Full Text]. van den Berghe G, Wouters P, et al. Intensive insulin therapy in the critically ill patients. N Engl J Med. 2001 Nov 8. 345(19):1359-67. [Medline]. Krinsley JS. Effect of an intensive glucose management protocol on the mortality of critically ill adult patients. Mayo Clin Proc. 2004 Aug. 79(8):992-1000. [Medline]. [Full Text]. Vlasselaers D, Milants I, Desmet L, et al. Intensive insulin therapy for patients in paediatric intensive care: a prospective, randomised controlled study. Lancet. 2009 Feb 14. 373(9663):547-56. [Medline]. Furnary AP, Zerr KJ, Grunkemeier GL, Starr A. Continuous intravenous insulin infusion reduces the incidence of deep sternal wound infection in diabetic patients after cardiac surgical procedures. Ann Thorac Surg. 1999 Feb. 67(2):352-60; discussion 360-2. [Medline]. Davidson PC, Steed RD, Bode BW. Glucommander: a computer-directed intravenous insulin system shown to be safe, simple, and effective in 120,618 h of operation. Diabetes Care. 2005 Oct. 28(10):2418-23. [Medline]. [Full Text]. Cameron CG, Bennett HA. Cost-effectiveness of insulin analogues for diabetes mellitus. CMAJ. 2009 Feb 17. 180(4):400-7. [Medline]. [Full Text]. Larkin ME, Barnie A, Braffett BH, Cleary PA, Diminick L, Harth J, et al. Musculoskeletal complications in type 1 diabetes. Diabetes Care. 2014 Jul. 37 (7):1863-9. [Medline]. Alberti KG, Gill GV, Elliott MJ. Insulin delivery during surgery in the diabetic patient. Diabetes Care. 1982 May-Jun. 5 suppl 1:65-77. [Medline]. Clement S, Braithwaite SS, Magee MF, et al. Management of diabetes and hyperglycemia in hospitals. Diabetes Care. 2004 Feb. 27(2):553-91. [Medline]. [Full Text]. McAnulty GR, Robertshaw HJ, Hall GM. Anaesthetic management of patients with diabetes mellitus. Br J Anaesth. 2000 Jul. 85(1):80-90. [Medline]. [Full Text]. [Guideline] Adams HP Jr, del Zoppo G, Alberts MJ, et al. Guidelines for the early management of adults with ischemic stroke: a guideline from the American Heart Association/American Stroke Association Stroke Council, Clinical Cardiology Council, Cardiovascular Radiology and Intervention Council, and the Atherosclerotic Peripheral Vascular Disease and Quality of Care Outcomes in Research Interdisciplinary Working Groups: the American Academy of Neurology affirms the value of this guideline as an educational tool for neurologists. Stroke. 2007 May. 38(5):1655-711. [Medline]. [Full Text]. [Guideline] Jauch EC, Saver JL, Adams HP Jr, et al. Guidelines for the early management of patients with acute ischemic stroke: a guideline for healthcare professionals from the American Heart Association/American Stroke Association. Stroke. 2013 Mar. 44 (3):870-947. [Medline]. [Full Text]. Domanski MJ, Farkouh ME, Zak V, Feske S, Easton D, Weinberger J, et al. Predictors of stroke associated with coronary artery bypass grafting in patients with diabetes mellitus and multivessel coronary artery disease. Am J Cardiol. 2015 May 15. 115 (10):1382-8. [Medline]. [Guideline] American Diabetes Association. Standards of medical care in diabetes--2008. Diabetes Care. 2008 Jan. 31 suppl 1:S12-54. [Medline]. [Full Text]. Lopez-Sendon J, Swedberg K, McMurray J, et al, for the Task ForceOn Beta-Blockers of the European Society of Cardiology. Expert consensus document on beta-adrenergic receptor blockers. Eur Heart J. 2004 Aug. 25(15):1341-62. [Medline]. [Full Text]. Sinert R, Adamson O, Johnson E, Tran D, Silverberg M. The incidence of previously undiagnosed diabetes mellitusin patients with soft tissue infections [abstract]. Acad Emerg Med. 2001 May. 8(5):538. [Guideline] American Diabetes Association. Standards of medical care in diabetes--2015. Diabetes Care. 2015 Jan. 38 Suppl:S1-93. [Full Text].